Last year we introduced new subwoofers from SVS and in the meantime, the American specialist has launched two new models. The SB-4000 subwoofer and the PB-3000 bass reflex version promise accurate frequencies and advanced technology. In the following, we present the two reference models. First of all, it should be noted that bass performance and precision are most impressive. With the 13-inch SVS driver, both giants of the 3000 series have a large and extremely advanced driver. It offers a low output frequency and provides enormous speed. Combined with a voice coil, it produces vibrating bass that lives on high precession. The amplifier delivers a full 800 watts of RMS and the 50 MHz processors ensures pinpoint quality at the tonal level. The two subwoofers are controlled via the mobile Bluetooth app from SVS. It is available for Apple as well as Android. It controls the volume, accesses several DSP functions and can be used to create three user-defined settings for music, movies, games and more. The SB-3000 closed subwoofer weighs 24.7 kg and comes in either ash black or piano black. Here is a lot of power in a very compact cabinet. With its 33 cm chassis, the Sub has 3 cm more than its predecessor. The output stage has also been further developed and is much more powerful. Controlling a room with high output levels and deep bass is child’s play with this model. The Class D amplifier promises a precise and unadulterated quality at the tonal level. The SB-3000 comes with an audio adapter for the wireless sound pass, subwoofer inputs, and outputs and of course the mains connection. In addition, the woofer is operated on the rear like its predecessors. There are buttons for volume, crossover frequency, and phase. The functions can also be conveniently controlled via the subwoofer app. When it comes to accessories, the Sub has an aperture and, of course, a power cable. The SB-3000’s musicality will be appreciated by audiophile hi-fi fans, while home cinema lovers* will be impressed by the thundering, cinema-like sound. With the PB-3000, the efficiency of the subwoofer is, of course, increased even further. It comes in black ash color and is a real heavyweight with 44 kg. It is a bass reflex subwoofer: lowest octaves without distortion are a feature of this model. 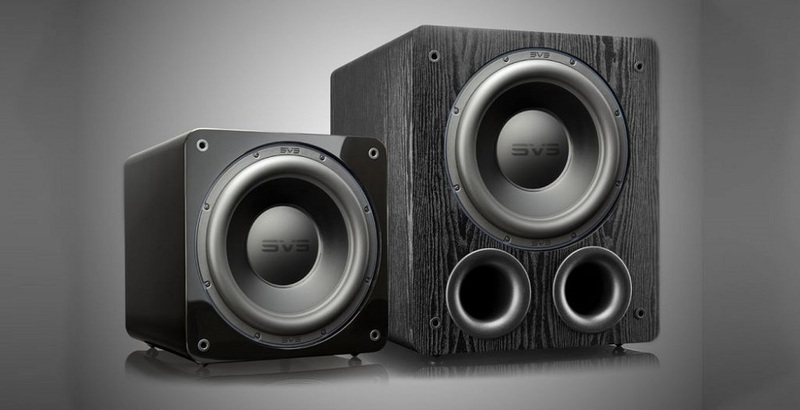 The PB-3000 doesn’t differ from the smaller model in its connections, but this bass speaker is SVS’s first dual-port subwoofer. Once the two forward facing bass reflex tubes are turned open, their enormous power maximizes airflow and prevents turbulence. The 13-inch driver thus achieves its best effect without affecting the listening pleasure with ambient noise. Thundering depths with flawless sound accuracy are the result.